The book of Judges is the part of the Bible saga where we see a fledgling nation forming. The twelve tribes have survived the rigors of their years of desert wanderings, following the pillar of fire and smoke which protects them. Joshua has led them into the land promised to them and they have secured a foothold where a kingdom will be established. A series of judges, or heroes, will rise up to gather the people to remind them that Yahweh has promised land, kingdom and blessing . . . and that they, God’s people, owe their creator fidelity, loyalty and obedience. This is the covenant they have entered into. The context for these stories is “Holy War” and close reading of Judges, in which so much war is waged, tells us that we are called to cooperate with God’s plan and providence rather than serve our own small agendas. The whole point of this part of the story is to stay the course, but it must be God’s course and not our own. The forces of darkness cannot stand up to the perseverance, the innocence and the trust of the faithful. Deborah does this well. 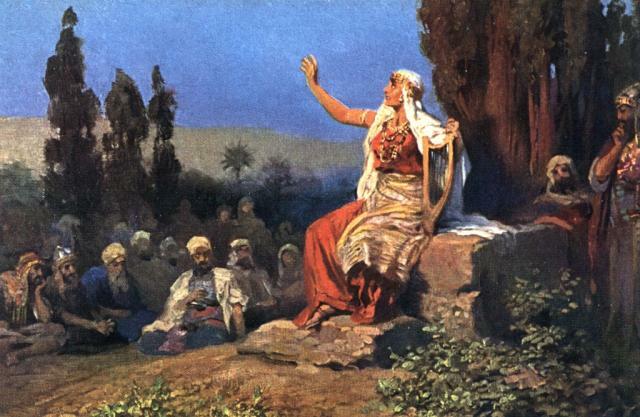 In the preceding chapter we see this prophetess sitting under her palm tree delivering just decisions to the people. We also see Jael, wife of Heber, lure the enemy Sisera into her tent to kill him with a tent peg to the temple. Jael kills this enemy because Yahweh has ordained it as spoken through Deborah; and we find that these tribes fight off the pagan peoples any way they can; always consulting with Yahweh before going into battle. In these ancient times, the struggle to survive dominated all aspects of life and we see a good deal of brutal interaction. Yet is our interaction any less brutal today? Deborah judges the tribes during the period of time which coincides with political unrest following the death of Ramses II in Egypt. The time of transition proves difficult for these people who struggle not only against the pagan nations that surround them, but also with conflict among the tribes. David will unite these people into a true political and spiritual kingdom, and hoos son Solomon will erect a Temple which speaks to the fame of this people and their God. Deborah leads well because she listenes well when she speaks with God each day and it is against this voice, this measuring stick that she measures her own life. We will want to follow her example of fidelity as we struggle against the violence that surrounds us. Adapted from a reflection written on November 18, 2007. In praying Psalm 11 we can be mindful that our reliance on God bolsters us and so we need not rely on our own strength. The innocent psalmist depends on the Lord’s protection for God defends those who seek asylum in God’s temple. It is good to know that we are allowed to flee when the wicked begin to hunt down those who are “upright of heart”. The image of archers hunting birds is an apt one in Psalm 11. The friends and advisors here are worried about the collapse of the foundation, but we are reminded in this prayer that God sees all, and that God “detests the lover of violence.” We reflect today on the many forms of violence beyond the obvious physical violence. We remember as well the insidious and hidden deceit that wounds as deeply and as surely as the arrow meant to still the faithful heart. Psalm 12 from THE MESSAGE: Quick, God I need your helping hand! The last decent person just went down, all the friends I depended on are gone. Everyone talks in lie language; lies slide off their oily lips. They doubletalk with forked tongues. We do not know where to go nor whom to trust; and just when we believe there is no salvation the Psalmist speaks words that foreshadow Jesus’ Beatitudes: Into the hovels of the poor, into the dark streets where the homeless groan, God speaks: “I’ve had enough; I’m on my way to heal the ache in the heart of the wretched.” It is in this way that God rescues the small and powerless from the influence and control of the arrogant. So let us pray . . .
Good and generous God, console and comfort us as we deal with backlash from our faithful witnessing to your goodness so that we might continue to witness to you. Good and tender God, offer us your protection when anger and violence stalk us so that we might seek refuge in the temple of your Spirit that lives in us. Good and powerful God, provide us with a refuge for the righteous at heart when slander and gossip surround us so that we might recoup our strength in the sacred presence of your love. Good and precious God, live in us always to deflect the arrows of the arrogant and restore our fragile hearts so that we might remain in unshakeable confidence in you. Good and humble God, abide with us as you do with the widow and orphan, the abandoned and anxious, and transform our worries and fears with your healing hope. We ask this in Jesus’ name in communion with the Holy Spirit. Amen. A Favorite from July 22, 2007. We spent time with James 3 several weeks ago when we considered living well, wisely and humbly, and at that time we reflected on how we might find joy in humility when the world so ably tells us that this cannot be so. And we considered the role of wisdom in the finding of this humility. God says: In the world’s view, the wise are usually surrounded by servants and dwell in comfort. This is not my view. From the world’s perspective, the wise wield power and influence, they control people, resources and perspectives. This is not my perspective. In the world’s judgement, the meek of heart are silly doormats. This is not my judgment. In my view, the wise serve rather than demand service. From my perspective, the meek are more powerful than all the legions in the world. In my judgment, the wise know more than all the scholars of the world, and they are more loving in their gentle humility to me than all those who make false claim to wisdom. Enter the word humility in the blog search bar and reflect on the gentleness of this quality . . . and how we might learn to live in this gentleness. Spend time with Philippians 4 today and reflect on the gentleness of wisdom. Today we continue to visit with scripture to look for stories about joy that will surprise us in a variety of ways. If you want to explore other stories in which joy astounds us, click on the word Joy in the categories cloud in the blog’s right hand sidebar and choose a reflection, or enter the word Joy in the blog search bar. You may also want to visit the Joy for the Journey blog at www.joyforthee.blogspot.com to see how joy surprises you there. Today our story is from the Book of Judges. In today’s story we have a cast of characters, most of them vicious and all of them passionate. Jotham, Abimelech and Jerubbaal are prominent as we visit Shechem, Beth-millo and Mount Gerizim; yet, despite the unusual names and distant locations, this is a story that in many ways takes place in our own neighborhood. Today we read about fear, violence and conspiracy . . . and the unexpected hope that always accompanies us, even in the most dire of circumstances. Jotham escapes assassination and summits mount Gerizim to pronounce the tale of the trees that speaks truth in a way that even the hardest of hearts can understand. We may have heard this fable of the trees as children but if not, today we take the time to sit with it. We listen to the words from the olive, the fig, the vine and the bramble to see if we might hear them from the lips of friends, family or colleagues. Or perhaps we have uttered – or thought – these words ourselves. Perhaps we have experienced the violence we read about today in a very real, physical way; or perhaps we have suffered emotional trauma that has left its marks of damage on our hearts and minds. Whatever the case, we have something to learn. Joy is always present in the darkest of hours. Joy is always possible in the most evil of conspiracies. Joy is constantly with us in the presence of God.